Sub: Cases of promotions taking place in the pre-revised pay structure between 01/01/2006 and the date of notification of Central Civil Service (Revised Pay) Rules 2008 and the subsequent merger of the pre-revised pay scales of the promotional and feeder posts in a common grade-regarding acceptance of exercising option for fixation of pay. A copy of Ministry of Defence, Department of Defence Production, New Delhi, MoD ID No.50(105)2016-D(Estt/NG) dated 06/06/2018 on the above subject received under OFB No-01/6th CPC/Pay Fix/Per/Policy, dated 29/06/2018, is forwarded herewith for information and necessary action, please. Sub: Cases of promotion taken place in the pre-revised pay structure between 01.01.2006 and the date of notification of CCS (RP) Rules, 2008 and the subsequent merger of the pro-revised pay scales of the promotional and the feeder posts in a common Grade - regarding exercising revised Option for Fixation of Pay. The undersigned is directed to say that the OFB’s proposal to allow revised option for fixation of pay in respect of those employees of OFB whose promotion took place in the pre-revised pay structure between 01.01.2006 and the date of Notification of CCS(RP) Rules, 2008 and the subsequent merger of the pre-revised pay scales of promotional and the feeder posts in a common grade was referred to DOP&T for their consideration and approval. 2. The DoP&T, vide their ID Note No.1304793/18-Estt. 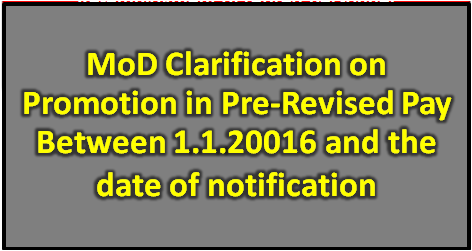 (Pay-I) dated 25.05.2018, has agreed to the proposal of MoD to allow revised option for fixation of pay in respect of those employees of OFB whose promotion took place between the period of 01.01.2006 and the date of Notification of CCS(R.P) Rules, 2008 subject to the condition that they fulfill the criteria laid down in Department of Expenditure's OM No.F-2-1/2005-E.III(A) dated 16.10.2015. 3. Copy of the DOP&T‘s ID Note No.1304793/18-Estt. (Pay-I) dated 25.05.2018 is enclosed. 2. The . instant case of D/o Defence Production relates to Ordnance Factory Board's proposal regarding allowing revised option or fixation of pay in cases of promotion taken place in the pre-revised pay structure between 01.01.2006 and the date of Notification of CCS (RP) Rules, 2008 and the subsequent merger of the pre-revjsed pay scales of the promotional and the feeder posts in a common grade consequent to implementation of the 6th CPC recommendations. 3. The brief facts of the case may kindly be perused at page 4-7/ante. 4. It may be stated ...... one month from the date of such unforeseen developments or change of rules. 5. In this regard, it may be mentioned that the instant case is covered under the provisions of this Department's OM dated 25.02.2003, as the merger of the posts of some feeder and promotional posts viz. Assistant & Office Superintendent, Chargeman-II and Chargeman-I, Asst. Foreman/Foreman/Store Holder & JWM; PA-I & PA-II, etc. in a common grade/post in OFB on the recommendations of the 6th CPC and also the re-fixation of pay under Rule 13 of CCS (RP) Rules, 2008 on the basis of D/o Expenditure's OM No. 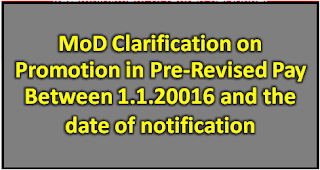 F-2-1/2015-E.III(A) daed 16.10.2015, were unforeseen developments/change of rule.